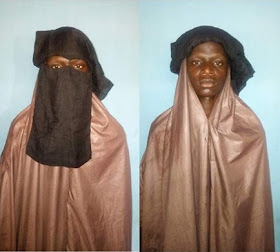 Four suspected kidnappers dressed in female cloths have been arrested trying to abduct an unnamed four-year-old boy. Mubarak Babangida ‘m’ aged 21yrs of Dutsen Safe Low Cost, Abubakar Lawal Suleiman ‘m’ aged 19yrs of Kerau qrts, Katsina, Aliyu Lawal aged 22yrs of Adoro Qrts, Katsina and Nura Abdulhamid alias Bazgi ‘m’ aged 22yrs of Filin Pipes Katsina. He said, "On 04/04/2018 at about 18:00hrs, based on a tip off, the Divisional Police Officer, GRA Division Katsina, CSP Garba Isah, succeeded in busting a notorious syndicate of kidnappers terrorizing Katsina state and its environs. "The DPO received a distress call of unusual movement of two men with one among them wearing Hijab and Niqab covering his body and face like a woman very close to INEC State Headquarters Office, GRA, Katsina. The DPO swiftly swung into action and led a Surveillance team to the area, where they were arrested." "As soon as investigation is concluded they shall be charged to court," he added.